Lots of recipes use flour as a thickener, a coating or another ingredient, but that won't work for you if you're on the gluten-free diet because you have celiac disease or non-celiac gluten sensitivity. The good news is that it's easy to substitute cornstarch for flour when your recipe calls for a thickener (as in gravy, sauce or pie) or a coating for fried foods. However, you should be aware that you can't use cornstarch as a substitute for flour in baked goods; you will need gluten-free flour blends you can use cup-for-cup. While pure cornstarch is gluten-free (it's just made of corn), some brands aren't considered safe on the gluten-free diet so choose a safe brand of gluten-free cornstarch. Here's a guide to substituting cornstarch for flour in recipes. 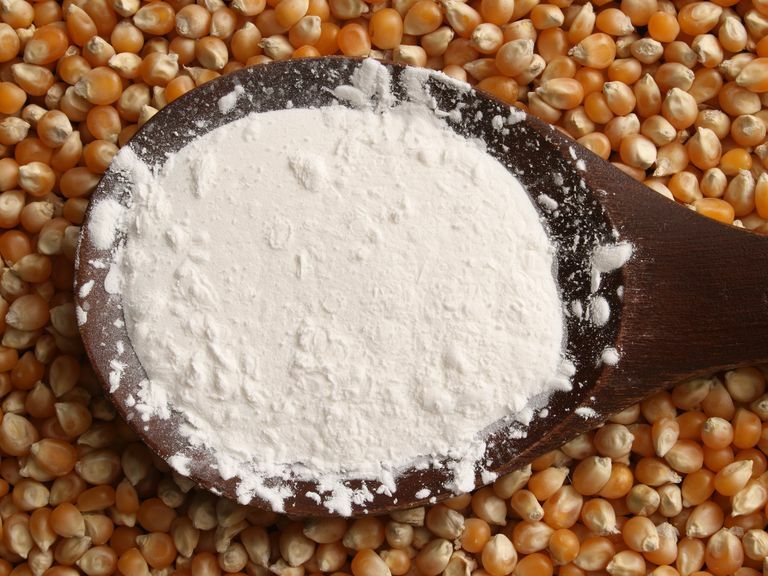 Cornstarch works remarkably well as a thickener in sauces, gravy, and pie fillings, and some prefer it to flour. You won't be able to taste the cornstarch the way you sometimes can taste the flour. Be aware that these foods will be more translucent. This occurs because cornstarch is pure starch, while flour contains some protein. You can't use cornstarch as a tablespoon-for-tablespoon substitute for flour. Generally speaking, you should use 1 tablespoon of cornstarch for each cup of sauce/gravy of medium thickness. Don't add the cornstarch directly—it will clump up and form lumps in your sauce that will be very difficult to dissolve. To avoid this problem, mix the cornstarch with a little cold water (1 tablespoon water to 1 tablespoon cornstarch) until it's dissolved. Then pour the water/starch mixture (known as a slurry) into what you're cooking. Make sure the water you use is cold, and keep stirring as the mixture begins to thicken. Cook over medium-low to medium heat, because high heat can cause lumping. Stir gently while cooking, as stirring vigorously can break down your mixture. If you need to add more ingredients, remove the pot from the heat and stir them in quickly and gently. Bring the mixture to a full boil for one minute, which allows the starch granules to swell to their maximum. Reduce heat as it thickens. Overcooking can cause mixtures to thin when they cool. Cornstarch isn't as effective as flour when thickening acidic sauces. It won't work well with those made with tomatoes, vinegar, or lemon juice. Cornstarch also isn't as effective as flour when thickening sauces made with fat, such as butter or egg yolks. If you have too little liquid in your mixture, there may not be enough for the starch granules to absorb. This is also the case when you have more sugar than liquid, in which case you may need to add more liquid for the mixture to be firmer. You might want to avoid freezing any sauces or gravy you make with cornstarch since they won't freeze well. They turn spongy. You easily can use cornstarch instead of flour as a coating for fried chicken, fried fish, or other fried dishes. Cornstarch will create a crisper coating that will hold up to sauces better and will absorb less of the frying oil (leading to a lower-fat meal). Make sure you have a light, even coating of cornstarch on the food you're frying. Heavier coatings can get gummy. Consider a 50/50-blend of cornstarch and gluten-free flour—this will give you a coating that's closer to wheat flour-breaded fried chicken. When cooking gluten-free, you may be able to continue to enjoy some of your favorite sauces by learning how to use cornstarch and other gluten-free thickeners. While mastering the art of substitutions can take some trial and error, it can also inspire creativity in the kitchen, leading you to also whip up new creations of your very own. Frequently Asked Questions. Argo & Kingsford's Corn Starch. Thompson T et al. Gluten Contamination of Grains, Seeds, and Flours in the United States: A Pilot Study. Journal of the American Dietetic Association. 2010 Jun;110(6):937-40. What Foods Should People on a Gluten-Free Diet Avoid? Many Mediterranean Recipes Include Couscous, But Is It Safe? Eating Gluten-Free and Ordering Sushi? Don't Make These Mistakes!